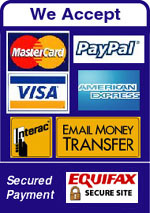 By using one of the following payment methods, you can save 3% from our regular price on any product online. For walk-in customers, pay by cash or debit card/Interac and get 3% discount from our regular price. We highly recommend the Interac Email Money Transfer. It is a simple, convenient, and secure way to send and receive money directly from one bank account to another. All you have to do is to access online banking through a participating banks or financial institution, and send money to anyone with an email address and a bank account in <?xml:namespace prefix = st1 ns = "urn:schemas-microsoft-com:office:smarttags" />Canada � without sharing any personal or financial information. It's a great alternative way to pay cash online.